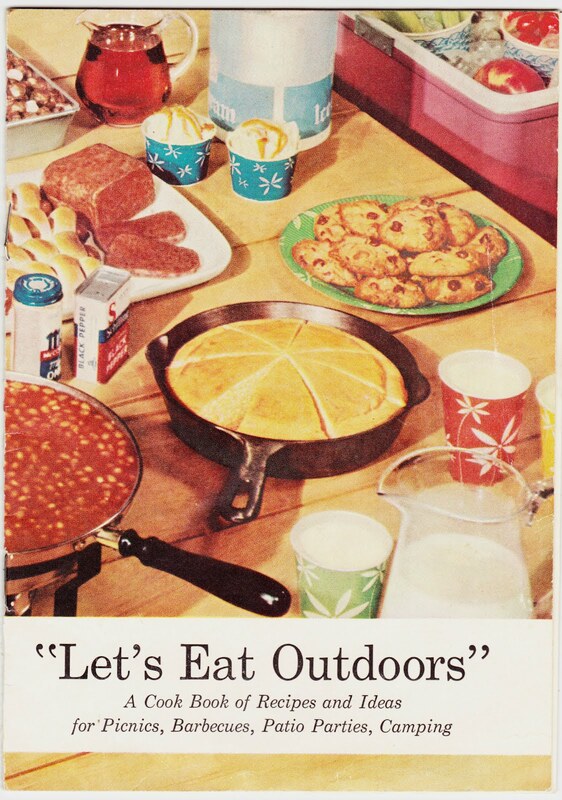 Papergreat: Touting milk: "Dairy foods add enjoyment to outdoor eating"
Touting milk: "Dairy foods add enjoyment to outdoor eating"
Pictured above is the centerfold illustration from "Let's Eat Outdoors," an undated (1960s?) staplebound booklet published by the American Dairy Association. 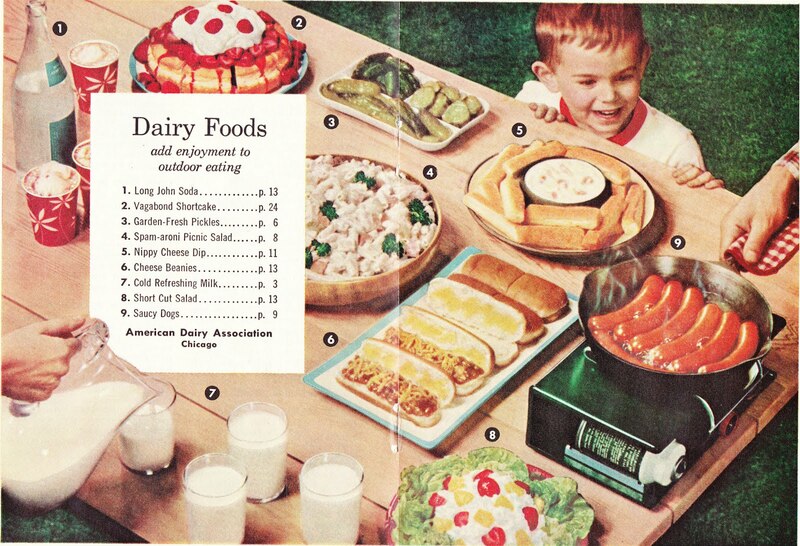 The centerfold features a pleased youngster examining hot dogs, someone pouring glasses of milk and a list of some of the tantalizing recipes within the 28-page booklet. 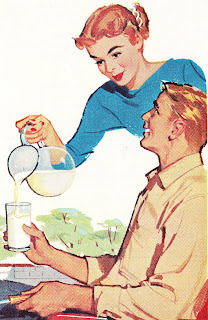 Yes, in addition to some dubious-sounding recipes, the pamphlet is pushing the benefits of milk as a refreshing summer beverage. Cooling idea for hot days -- enjoy milk or buttermilk outdoors -- just as it is.1 When a glamorous cooler is called for, try these easy ways to make milk really extra special. LEMON REFRESHER: Combine and mix until light and fluffy 1 qt. cold milk, ½ cup fresh lemon juice, 6 tbsp. sugar, ½ pint vanilla ice cream. New and delightful for patio or back yard meal refresher. RASPBERRY FLIP: To 1 qt. of thoroughly chilled milk, add 1 cup Stokely's Red Raspberry Preserves. Stir thoroughly. Serve at once. MAPLE NUT MILK: Before the barbecue or picnic, beat together 1 qt. milk, 1 cup Karo Maple-y Syrup, ½ cup creamy peanut butter, 1 tsp. McCormick-Schilling Maple Flavoring. Chill and carry in cooler. Those recipes are dotted with product references, as is the entire booklet. Some of the brands mentioned throughout include Bisquick, Trix, Hormel, Karo, Nescafé, Nestea, Van Camp's, Coleman, Dixie Cups, Dinty Moore, and Betty Crocker. A salad fit for a feast! Dissolve gelatin, following package directions. Chill until partially set. Add remaining ingredients. Chill until firm. (For picnics, chill right in Dixie cups.) Serve with Garlic Butter Sticks. 1. No. A glass of cold buttermilk on a hot day does not sound fun. 2. So, to be clear, "Calypso Cooler" is just another name for "chocolate milk." 3. 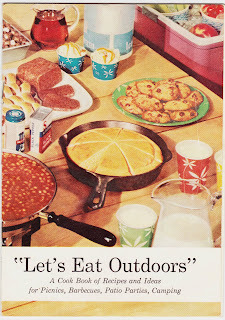 Other odd recipes include Chicken Salad Upside Down and two different suggestions for mixing Spam into pancake batter. 4. What the heck are SALADettes? They sound terrifying. And that's before they're put in gelatin. The only other reference I found to the SALADettes was on a blog called The Vodka Party, which references the same booklet I'm writing about here. The Vodka Party states: "Stokely’s Saladettes seem to be a discontinued product (from a discontinued brand). I’m still not sure if they were small pickles, or a pickled version of the 'saladette' variety of tomatoes. Either way, anything in a Jello® mold other than Jello seems strange and off-putting to the 21st century palette."